October 2nd marks the 50th birthday of Redwoods National and State Parks, also a UNESCO World Heritage Site and an International Biosphere Reserve. This park is unique in that it is a partnership between federal and state, preserving a string of forests, beaches and grasslands along the northern California coast. This partnership helps to maximize the areas they can protect. 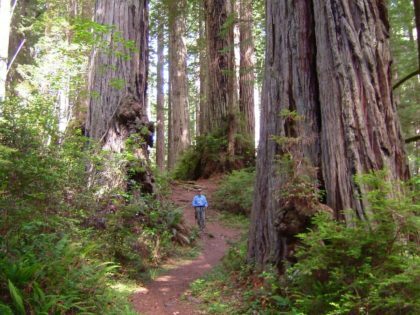 Of course, Redwood National and State Parks is all about these huge trees, protecting clusters of giant redwoods and ancient forests. These trees can only be found on the northern California coast and in Oregon. They are the tallest living trees in the world with an average age of 700 years. When you stand among these giants, you will feel dwarfed. It is incredible to see them towering above you. You simply can’t grasp their size just looking at a photo. You have to get out and stand among them to really appreciate their size. 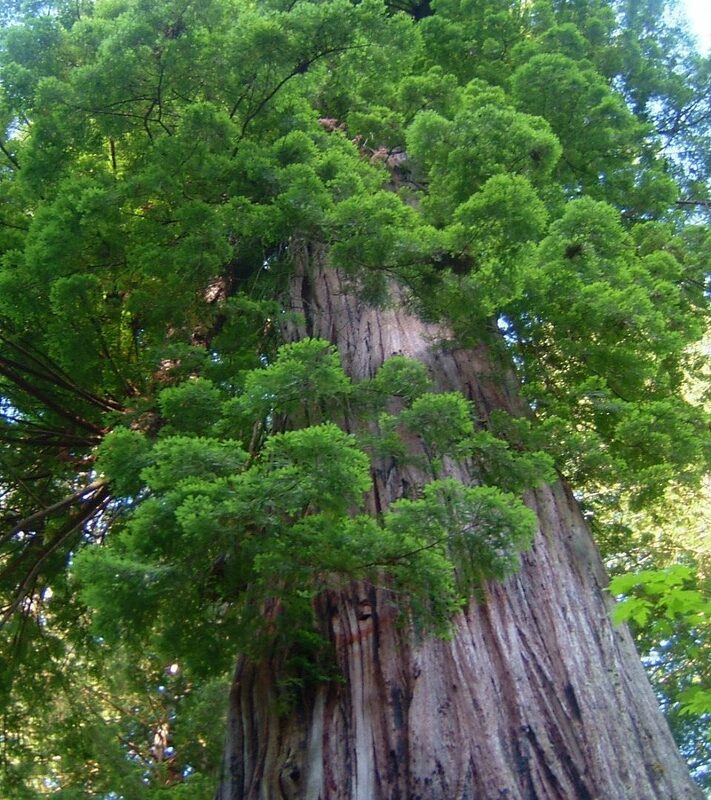 Think of this… Redwood trees can be taller than the Statue of Liberty! The statue is only 305 feet tall and giant Redwoods can grow up to 500 feet tall. Incredible! On our most recent visit, we went to the northern unit, almost at the Oregon border. We took a gorgeous drive through Jedediah Smith Redwood State Park on a dirt road, well graded but it went down to a single lane in sections so you can’t go too fast. We stopped at Stout Grove and walked on the short trails there. These were some of the biggest trees we had ever encountered. 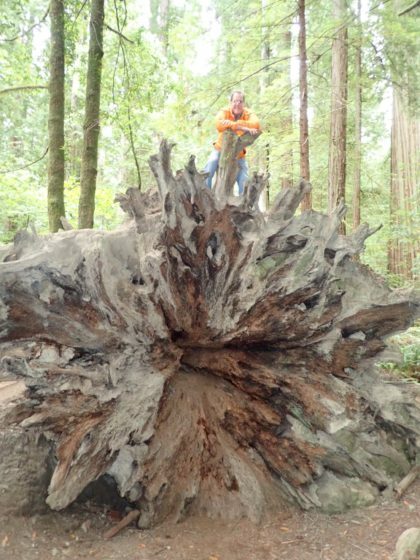 It was interesting to us to see not only the living trees, but also the ones that had fallen – how huge they are and the ginormous root system they have. Some of the fallen logs were so big we couldn’t see over them. But the park is more than just Redwood trees. It includes 40 miles of coastline and beaches, plus prairie, oak woodlands and wild rivers. One of our favorite memories was our first hike in the Redwoods. We started the hike at the Prairie Creek Visitor Center, beginning in the Redwood forest and hiking as far as the beach. 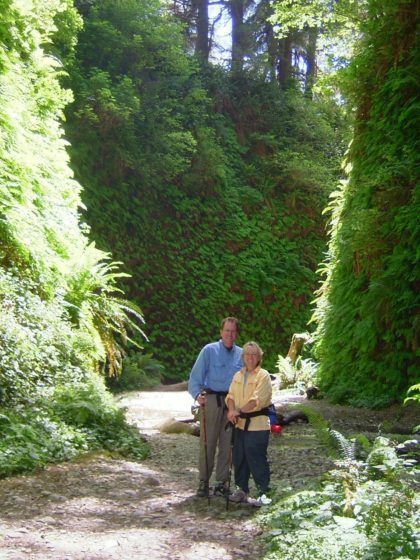 As we got closer to the beach, the tall trees gave way to lush ferns in aptly named Fern Canyon. That was totally unexpected and beautiful. It felt like we were in Hawaii. There are five visitor centers, lots of walking and hiking trails, beaches, scenic drives and camping. There are also lots of bicycle trails. We enjoyed the Davidson trail. It went from Elk Creek Campground to Elk Meadow. We saw elk every time we went on this trail. 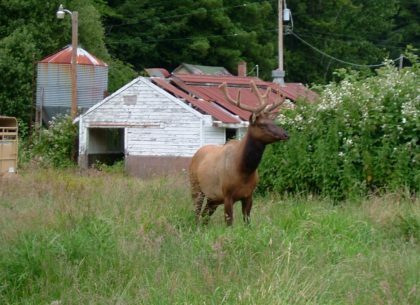 Roosevelt elk are truly amazing animals. We loved the campground in the park. It was amazing to camp in among these trees – so quiet and peaceful. 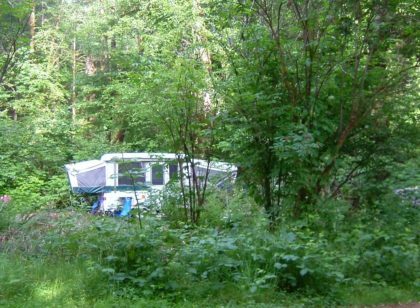 Other than backcountry camping (permit required) all four of the campgrounds are managed by California State Parks. Reservations are highly recommended, especially during the busy summer months. 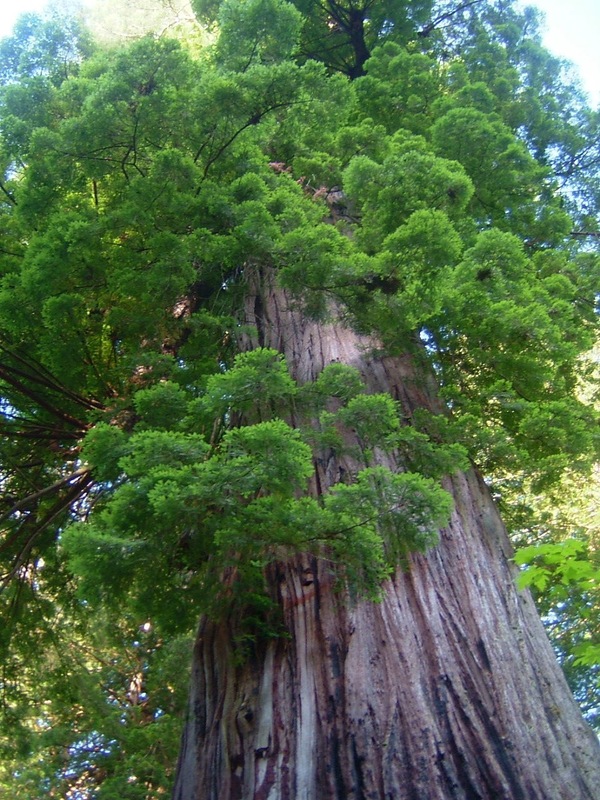 One visit to the Redwoods will be sure to get you to fall in love with these trees. (Certainly it made us vow to never build a Redwood deck!) Experiencing their magnificence made us reflect on the fact that they would have been gone had it not been for the foresighted folks who fought to preserve the last stands of these irreplaceable trees. We thank them and encourage everyone to think about conservation and get involved. NextThanksgiving in October or November?